My boat has the diamond shiny metal floor . I am told it is Aluminum. Will the Aurora Alumabrite work on this to clean and make shinny the areas that have tarnished from salt water?? Yes, Alumabrite will work for this application. 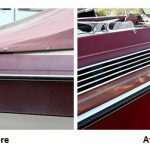 Be sure to degrease with Boat Clean Plus and water first, as Alumabrite will not penetrate grease or oil and will leave an uneven finish. If this is an ongoing problem you may wish the consider applying Alumetron to prevent the tarnish. It’s resistant to salt water.